Where did October go? It seems like Socktoberfest just started and here we are at the end...didn't October just fly by? I love this pattern - easy but interesting and I think the subtle colorway of the Fleece Artist really worked well with the lace! I highly recommend this well written pattern for beginner lace knitters and I can't say enough about this super soft, beautifully colored yarn! The Lotus Blossom Thistle Flower Tank is finished (woot, finally!) and is blocking even as I type so she won't make her debut for another few days....she is a real beauty tho! 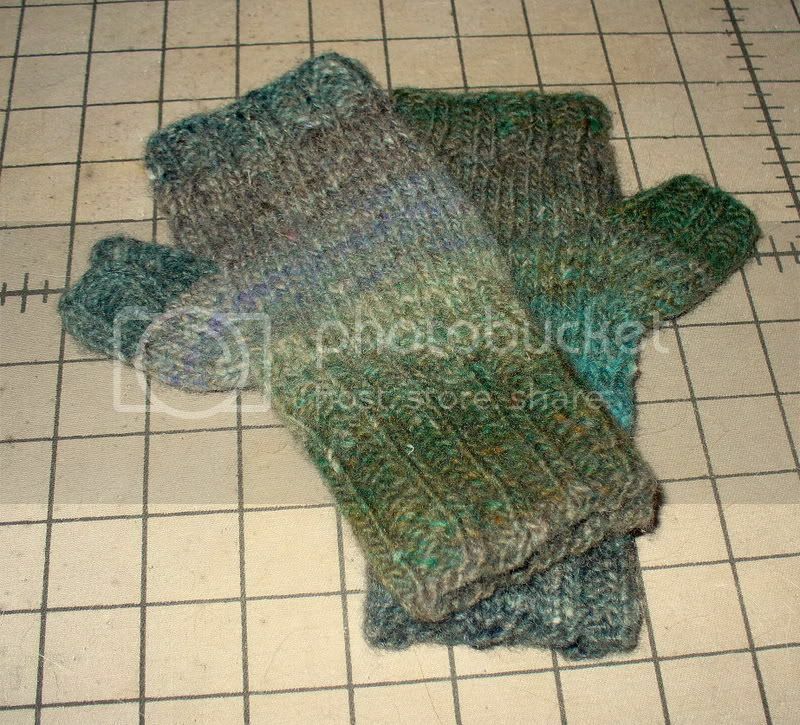 In all my years of knitting pre and post 15 year hiatus, I've never knit any sort of hand covering, I'm not sure why! I'm so glad I changed that cause they are almost as fun as socks! Totally fun and totally cute! 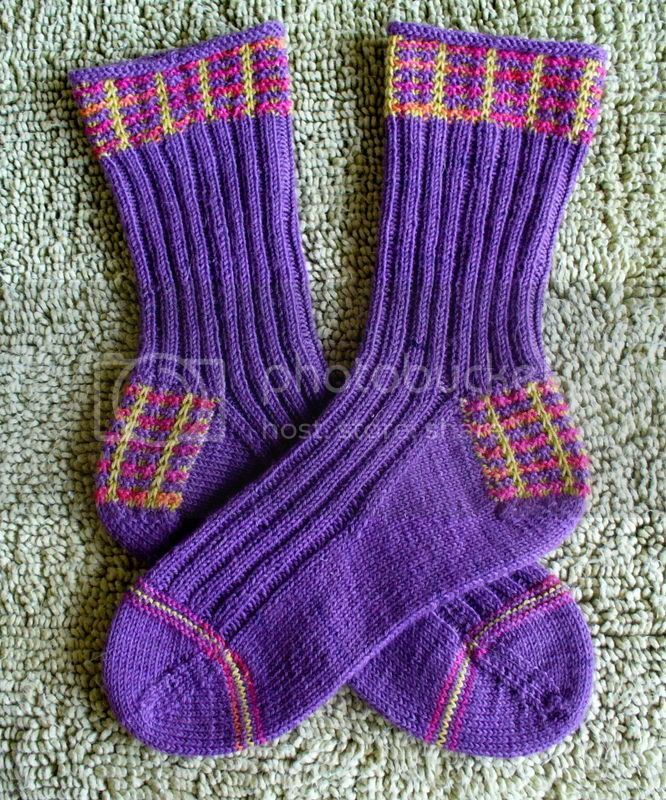 My neice is 17 and I think she's gonna go crazy for these....and they were so much fun to make I want to knit her a whole wrister wardrobe! I've seen so many bloggers knitting some variation on the fingerless mitt and now I know why! Another reason to love Knitbloglandia! Here's the P-Man playing with one of his favorite toys.....a backscratcher from the dollar store a friend bought me as a joke! He just loves to bite and "bunny kick" this thing, better than any of the assortment of genuine cat toys he has! Whatever the P-Man wants, the P-Man gets, what can I say? My "Great Pumpkin" and I wish everyone a Happy Halloween with lots of treats and no tricks! See ya soon! Those socks look so yummy. I love the color. I think you're going to get a large amount of 'cool aunt' points for those gloves. They look great! Happy Halloween and hugs to P-Man. Love the socks and the mitts. Auntie D scores! Funny what cats like to play with LOL Happy Halloween Debi and P-Man! Aren't those mitts fun? I am planning to make many for Christmas! I just made one from Knitty - still working on the 2nd one - and I think I am hooked too! Debi, these socks are ab fab! Such melon goodness, beautifully executed. And the beaded warmers? Major points. I also want to thank you for the crochet method reminder. Here's hoping you and Ze Great Pumpkin have a rockin' Halloween! The socks are beautiful! 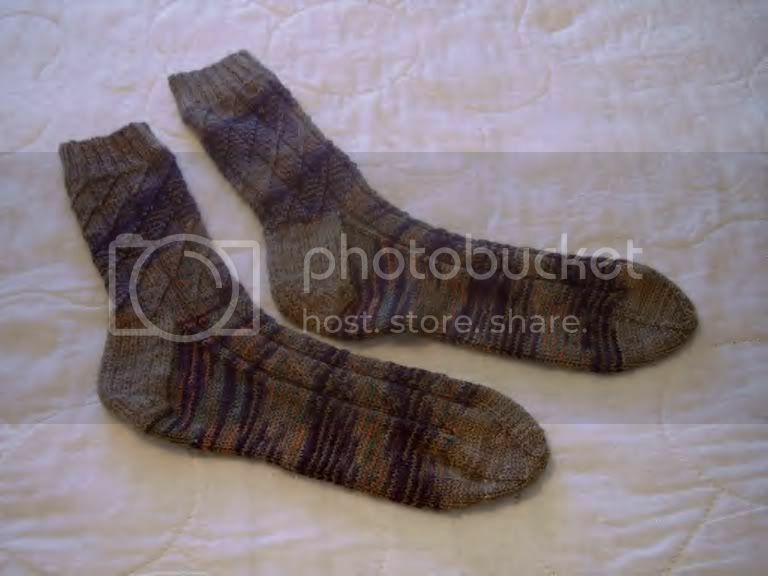 Maybe I'll give them a try but I'm pretty slow at sock knitting. I like the wristers too. I'm hoping to make some for my clarinet playing daughter for Christmas. Glad your computer is still up and running. Can't believe the trouble you've had! Happy Halloween to you and the P-man. Happy Halloween to you and Pumpkin too! The colourway of the Hedera socks is sooooo lovely! I am knitting the foot of the Sock Club sock ... also Miss Cookie's design. She is quickly becoming another sock designer-queen! LOL! First and foremost - I LOVE your pumpkin! lolol! 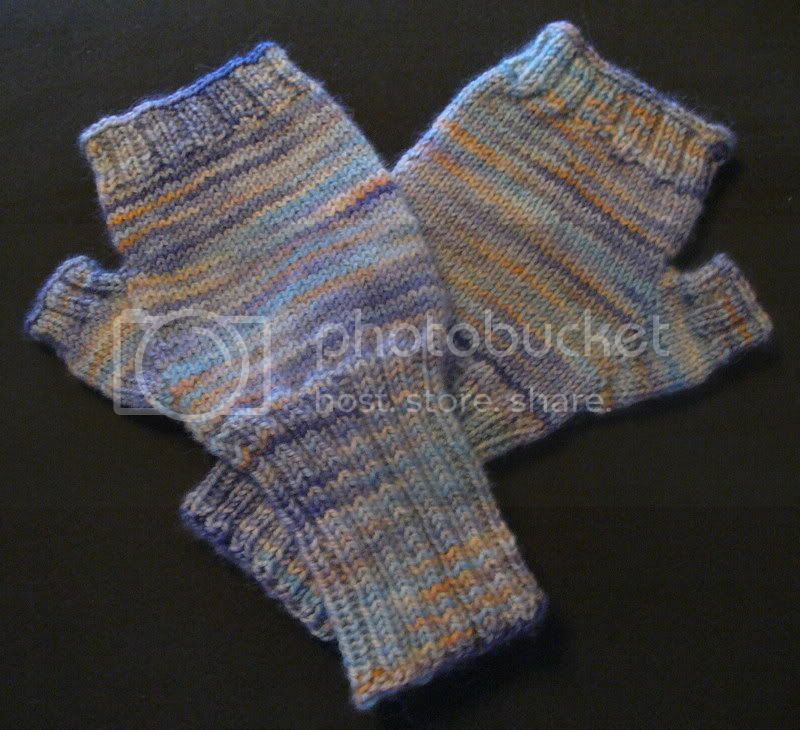 The knitted stuff is soooo cool - your niece is gonna love those mitts. 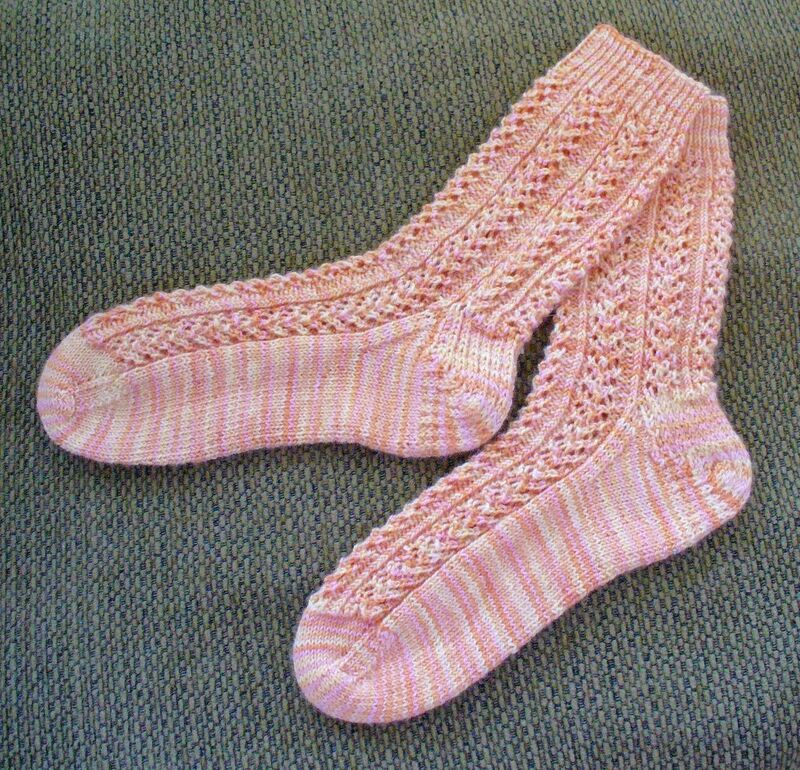 And the socks are so pretty. Love the pink. Can't wait to see the tank - whatever you want to call it - lotus or thistle! 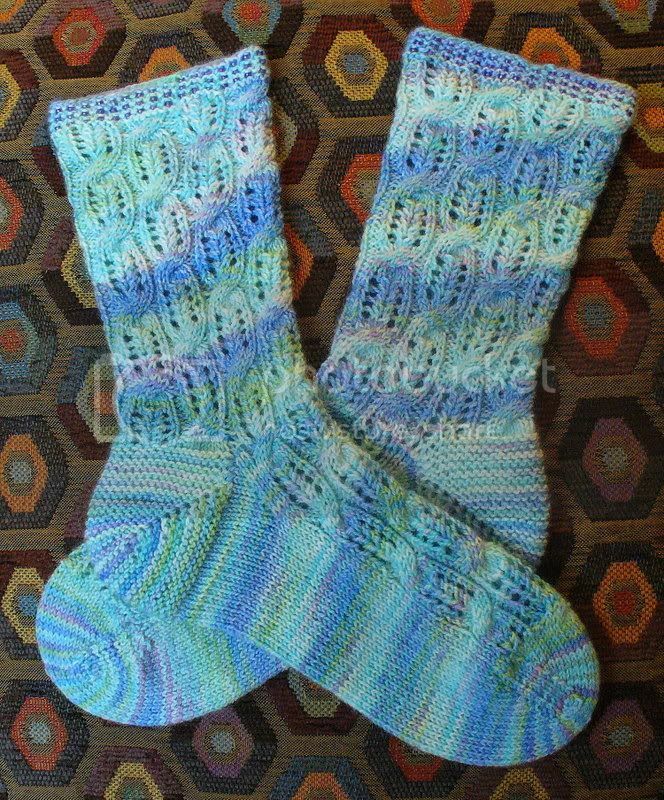 The socks are awesome - I love the color and the pattern. 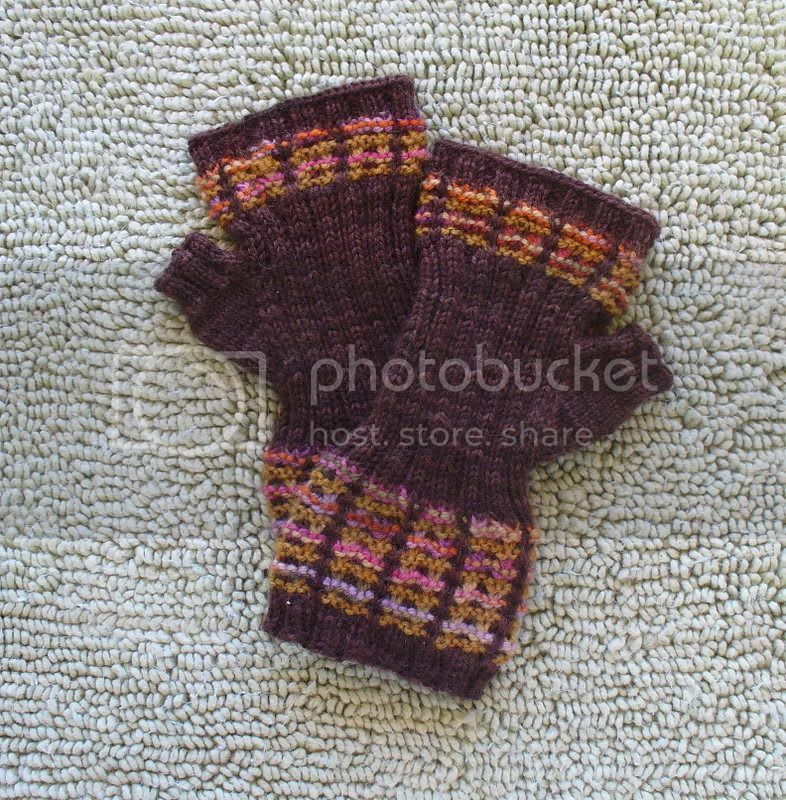 I love the mitts, but those socks! I absolutely adore that color with that pattern. I can see why they turned out to be favorites! The Hedera sock yarn looks really beautiful - subtle but still with impact. I can't wait to see the finished Thistle Tank! Wow! Two posts in quick succession - we could get used to this. I love the Hedera socks. I've had the pattern sitting out in my sewing room since it first came out. Now I've gotta do it - those are gorgeous! I love the wristwarmers too. I made my first pair (at least for me) several weeks ago and I can't believe how great they feel. You might not need them in Florida, but here in Washington, they come in handy. Maybe my next pair will have beads. Very nice socks, I think your right the color and the pattern go perfectly together. 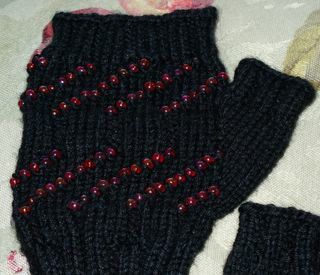 And what cute beaded wrist/hand/fingerless gloves for your niece! 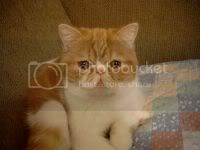 And pumpkin as always your adorable. A backscratcher, that's hilarious! 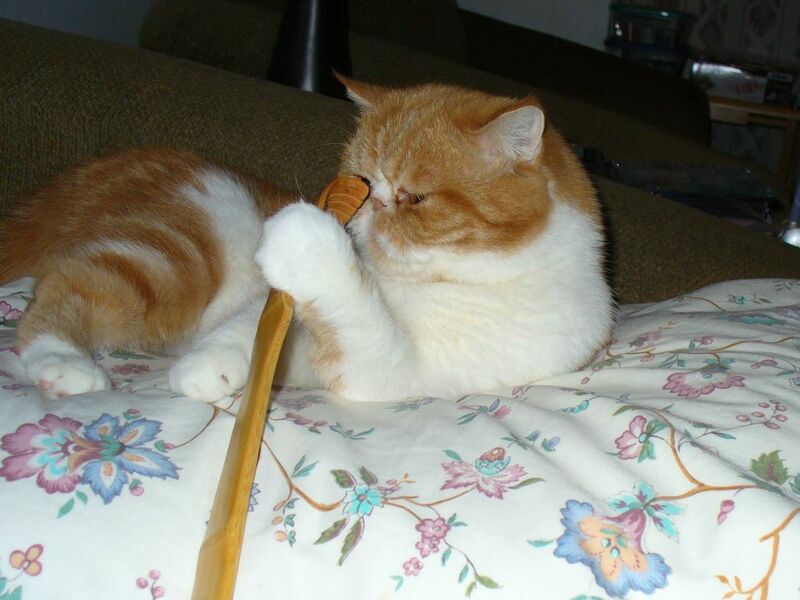 Sunshine likes pencils. It's always the box the toy came in that's more interesting, no? The wristies are great! Love the beads. Is it painful to put those on? I've never done it before, but it always looks great. Just not sure if I have the patience! The socks are beautiful. I love that colorway and it looks great with the pattern. First, glad to see you back online. Those socks are gorgeous, as are the wristers. Question, what size crochet hook do you use? Those look to be the same beads I got this past weekend at SAFF for a beaded scarf. P-man, WAY too handsome for his own good. Nice to know he actually plays with toys! He's a guy, he must like it cuz it's wood. the socks and mitts look GREAT! I really must get my hands on some Fleece Artist yarn! Your socks are so, so pretty! So is P-man..as always. 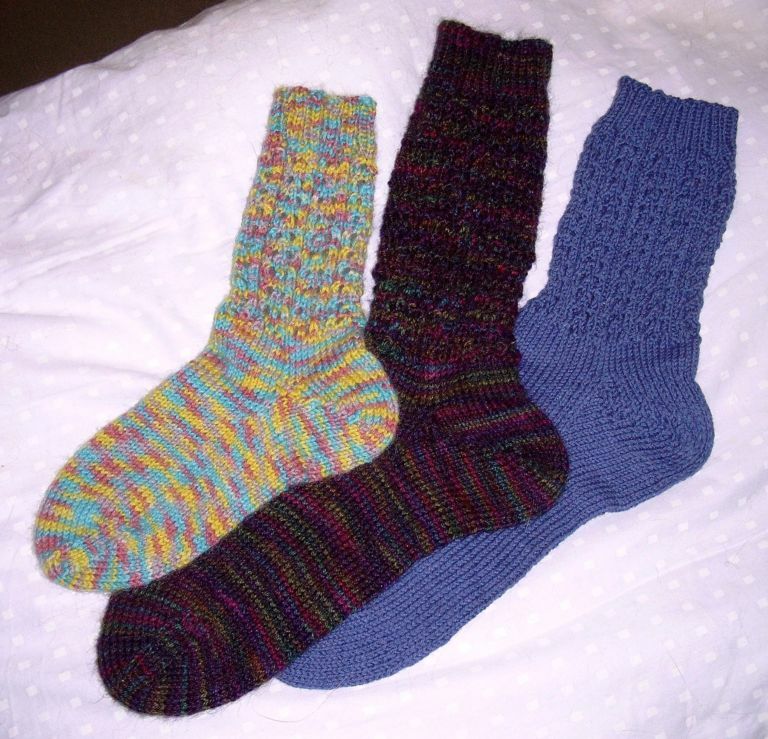 I tried to get the Rob's Twined Rib sock pattern, but the link (both of them) lead to a field of pop-ups. Any hints on how to get the pattern? Ohh...psssst...it's a secret, but Beth's birthday is actually on Monday (11/6). Don't tell her that I told you! LOL! The socks are beautiful!! Love the wrist warmers as well! 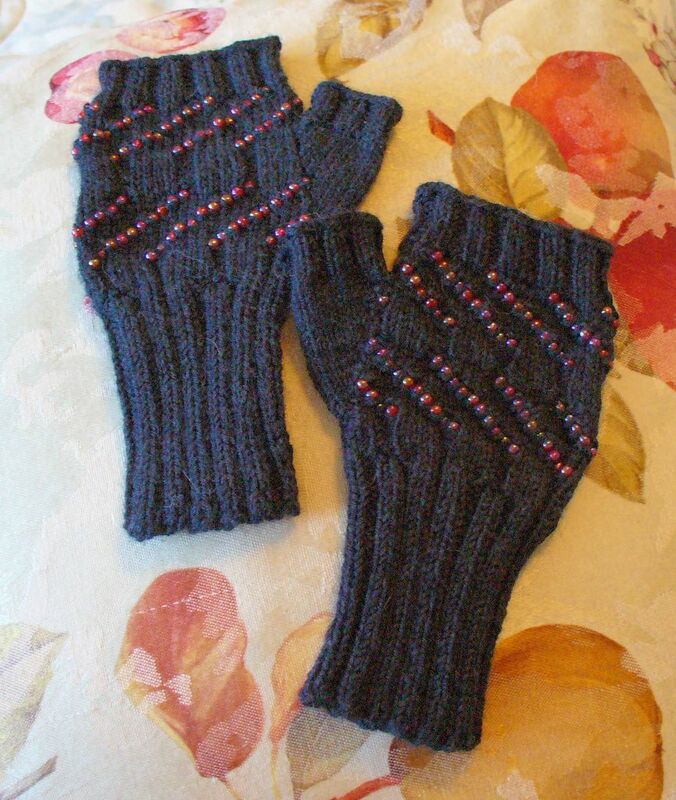 Your socks are fab but I love the wrist warmers. Too cool.